Returning home to Myrtle Point from an agricultural field trip to Astoria I was informed that the local state police office in Coquille had been trying to get in touch with me. Calling Officer Paul Williams, I was told of information being left at their office by William White, rancher and brand inspector from Port Orford, Curry Co., in regard to a truck load of big Hereford steers having been seen by another party (Seifert Iverson) coming out of the Sixes river area toward Highway 101. Iverson, having logged in the territory for two years or so and being more or less familiar with the character of the livestock in the area, was curious as to where such cattle might be from. I met Officer Williams the following morning and we decided to drive to Port Orford to talk with White and Iverson. We met White first and he informed us of his conversation with Iverson. He, also, was reasonably sure that no cattle of that kind were being raised and fattened on the lower Sixes. It was also his opinion that the good cattle on the headwaters of the Sixes would not be coming down river to be marketed. Leaving White, Williams and I headed up river to see Iverson. He was out on a logging job and we didn't get to see him but we drove on to the end of the county road, 12 miles up from Highway 101, to a place called Plum Trees. There we discovered a fairly new road coming down the mountain from the north. For many years I had been familiar with an old trail coming in from that direction. It had led on up 4 miles to what was known as the Wilson ranch. With this in mind, we decided to explore the new road. Driving two miles we found a gate hung between two fir trees with chain and padlock, but not locked. Driving on a few miles thru heavy timber we came into an opening which held a rather makeshift corral. By this time it was noon and quite warm. Watching our car we drove up were eight big Hereford steers. I told Williams before he stopped the car that those were my cattle. They were three and four year old steers which, along with 55 others of like ages had been on the back part of our range for over a year, cattle that I had expected to send to the Portland market in about three weeks. Sitting on a very warm pony with his eyes on the steers to prevent their escape thru an opening in the rear of the corral was a boy I had never seen. After sizing up the situation a little longer we decided to question the boy. He told us that they had just brought the cattle into the corral and that one steer had broken away from them and that other riders were out in the timber after him. I had observed a strong pen, recently constructed, adjacent to the larger pen. Rather than have the cattle "spooked" and risk having them break out of the weaker pen in which they were being held, I asked the boy to help drive them into the close pen. As I was fastening the gate, three other riders rode in. These were also men I had never seen before. Questioning the older man who later proved to be the brother of Myrtle Garner, principle defendant of the case to follow, he informed me that he was working for Mrs. Garner and there was still another cow boy out after the steer that had gotten away. The brother's name was Ralph Stevens. The absent cowboy was Burdette Young, employed, as Stevens explained, by a Loren Kerr. When asked the whereabouts of Loren Kerr we were told that he was at the house. Not knowing the location of the house in relation to the corrals, we decided to put under arrest the 5 horsemen immediately present and take a chance on the possibility of finding any others involved in the situation later. These five without being asked unsaddled their overheated horses, put up the saddles in an old shed and turned the horses out. 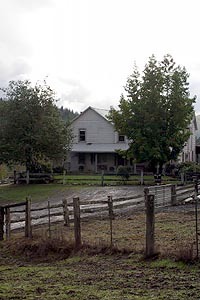 The Dement ranch house was largely constructed out of Port Orford cedar. Parts of the home date back to the late 1800s.